Pre-referendum (1 April–23 June), GBP/USD futures (CME) volumes ebb and flow over a typical day and are well-fitted with a Fourier series, (blue and pink lines). This periodicity matters in terms of considering the profitability of intraday trading strategies as varying liquidity conditions impact transaction costs. 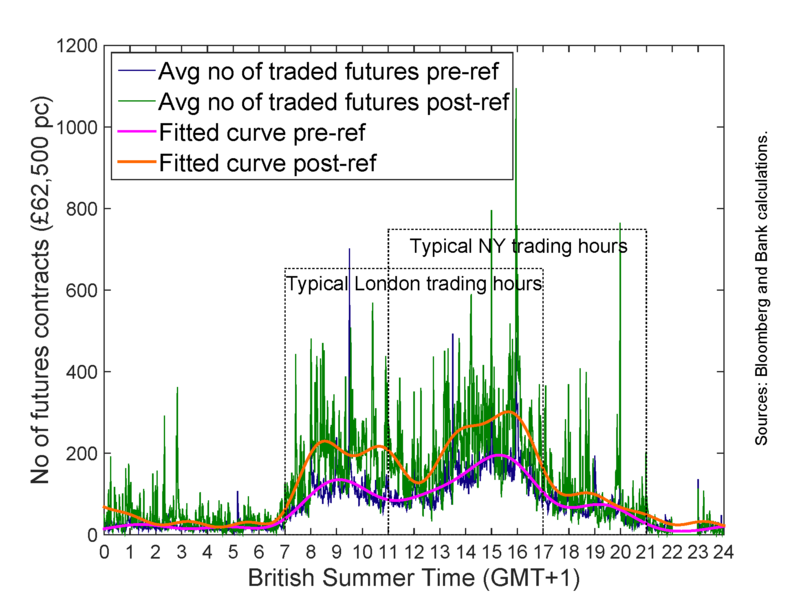 The average number of futures contracts traded picks up from 07:00 then declines until trading activity usually begins in NY around 11:00. Trading activity peaks at between 15:00 and 16:00. Note that there occurs a sharp jump in trading volumes coinciding with the 16:00 World Market/Reuters fixing window (2016, Oudshoorn and Chen). After typical London trading hours end at 17:00, volumes remain slightly subdued but constant until typical NY trading hours finish around 21:00. The outcome of the EU referendum took many FX market participants by surprise. This in turn led to a sudden and sharp increase in volumes post-referendum (27-29 June, green and orange lines). In this period, the average number of contracts traded increased markedly and remained somewhat elevated during typically-inactive trading hours between 00:00 and 07:00. Previous Post Does market liquidity risk affect Euro corporate bond returns more seriously in stress periods?